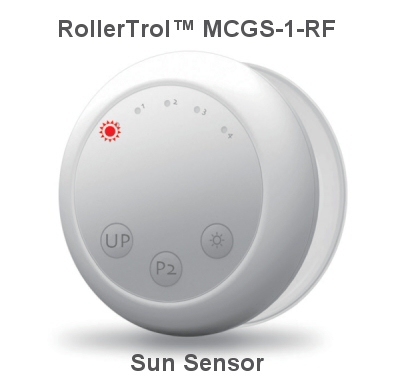 The light sensor can be used to directly activate our radio equipped blind and shade motors using a digital RF (Radio Frequency) control signal. In part 2 we discussed the procedure for assigning motors to the MCGS-1-RF wireless window mounted light sensor by cloning channels from the master remote. In this 3rd article, we will see how to detect the ambient light conditions, which will help select (and set) the most appropriate light sensitivity setting of the sunlight sensor. It has 4 operational sensitivity settings to choose from. These instructions assume that you have already assigned at least one motor, as discussed in Part 2. If you have not done that, please look at the instructions on that page before you adjust the sensitivity. 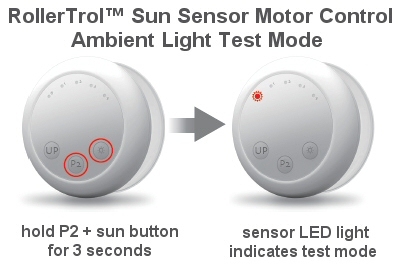 You can check the current ambient light level by entering a special test mode: Hold down P2 and the sunlight icon button at the same time for 3 seconds - the mode 0 LED lights up, indicating you have entered the test mode. You can now walk around with it, testing various light levels. If you hold it close to a regular light bulb (suction cup side should face the bulb), you should see it jump up to the 60k LUX level (LED #4), if the light bulb is bright enough. As you move the light sensor away from the bright light, it will jump to a lower LUX indicator. This special ambient light test mode will timeout in 2 minutes. You can also exit the test mode by pressing any of the 3 control buttons. The light sensor has 4 operational sensitivity modes. You can check the current sensitivity setting by pressing and releasing the mode button (the third button to the right, with the sunlight icon). The appropriate LED mode light will turn on when you do this, for about 1 second. If you press the mode button again, before the LED mode light times out in 1 second, it will switch the mode to the next highest setting. If it is already on the highest setting, it will recycle itself to the lowest setting and proceed sequentially in that fashion. Note that the higher setting decreases the sensitivity of the light sensor, requiring more light to trigger the motor action. A LUX is a unit of light intensity measurement (15k LUX = 15,000 LUX). When the light level increases beyond the current sensitivity level for more than 2 minutes, the sensor will issue a CLOSE command and the shade will deploy to the extended position. When the light level falls below the current sensitivity level for more than 15 minutes, the sensor will issue an OPEN command and the shade will retract to its fully retracted travel limit position. If you want to reverse the operation, please use the motor reverse programmable function: Radio Motor Reversing Instructions.